It’s Monday. I’m not happy about it either. Though, I hope I can help make your week just a little bit sweeter. As I mentioned yesterday, this is Fall Cookie Week here at Inspired by Charm. 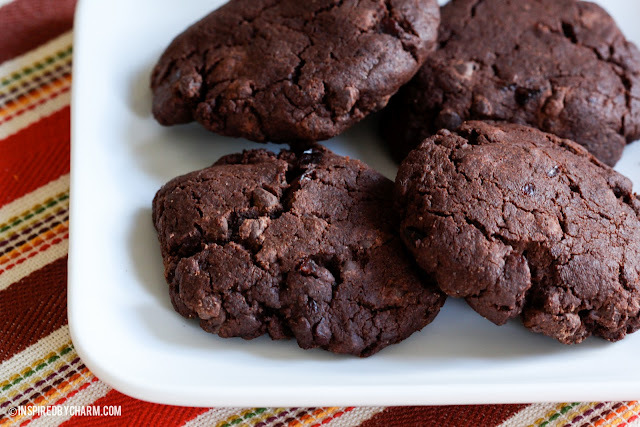 I have six, possibly seven, fall-inspired cookie recipes to share with you. While I didn’t take step-by-step photos this time around, I brought out my new macro camera lens and attempted to capture a few pretty photos. Seriously, I took over 700 pictures to get the shots I’ll be sharing with you. I hope you enjoy them. So, not only did I enhance my baking skills, I also worked on my photography. Multitasking, my friends. That’s how I roll! 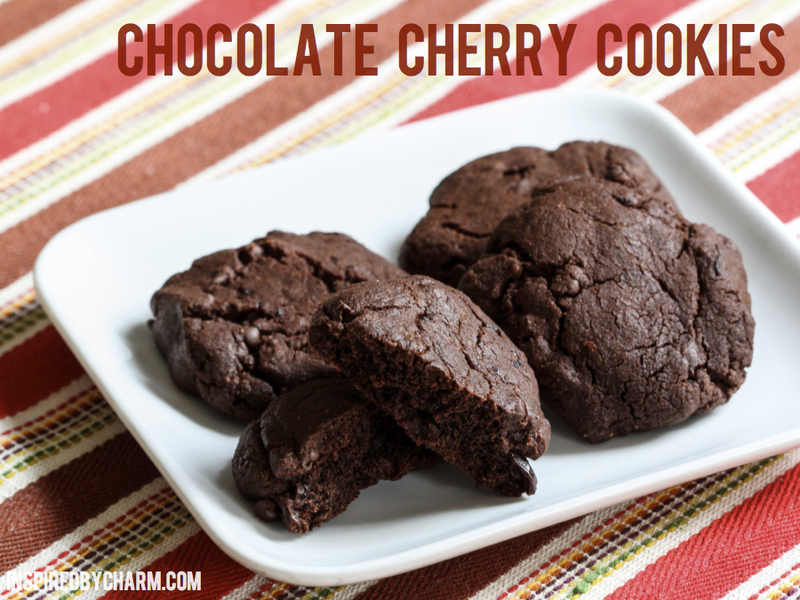 Today, I’m sharing my recipe for Chocolate Cherry Cookies. It was adapted from Bake or Break’s recipe for Double Dark Chocolate Cherry Cookies AND All Recipes’ (submitted by jrbaker) Lots of Chocolate Cherry Cookies. 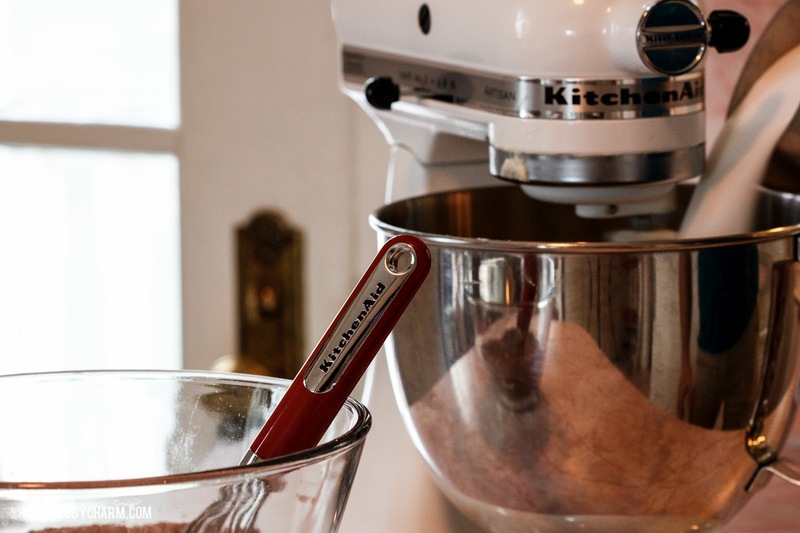 In a large bowl, whisk together flour, cocoa powder, baking soda, baking power, and salt. Set aside. Using an electric mixer on medium speed, beat butter, granulated sugar, and brown sugar until fluffy. About three minutes. Beat egg, instant coffee, and vanilla into the butter mixture. 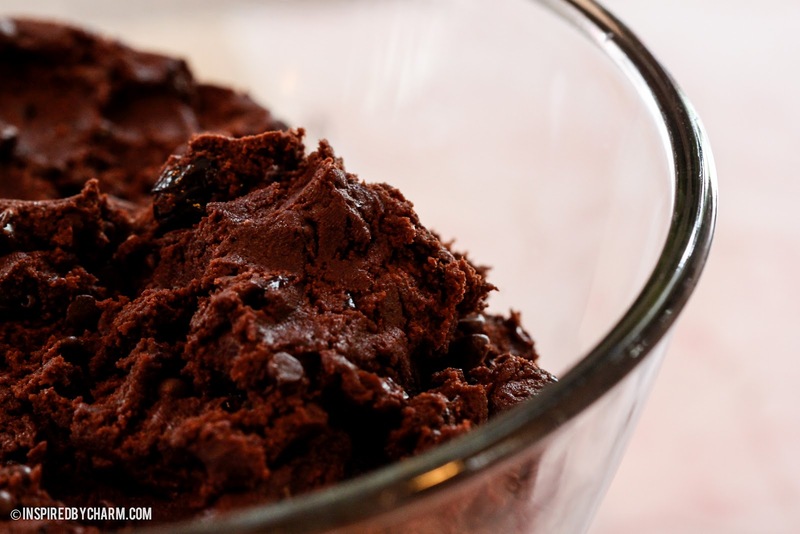 Using a spoon or spatula, stir in chocolate chips and cherries. Refrigerate dough for a few hours until it is firm. 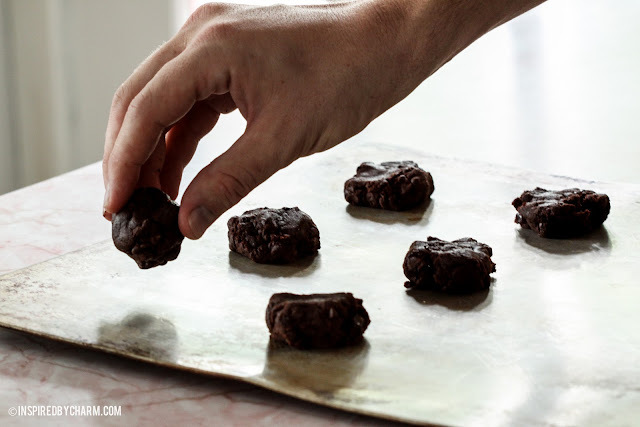 Drop spoonfuls (about 1.5 tablespoons) of dough two inches apart on to a baking sheet. Flatten dough balls with your fingers. Bake 12 to 15 minutes until cookies are just becoming firm. 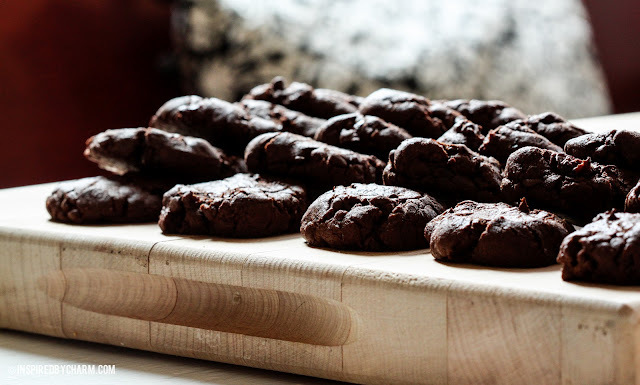 Remove cookies from baking sheet with a spatula. Allow to cool completely. That’s it! 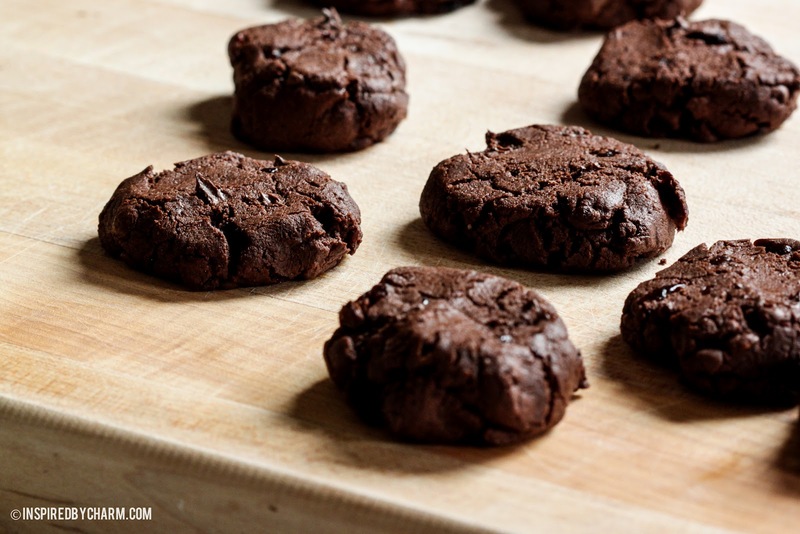 Meet me back here tomorrow for the next batch of cookies and a giveaway! Don’t forget, on Sunday I want to see your fall baking favorites. Get ready to link up your recipes in the Fall Cookie Week Link Party! 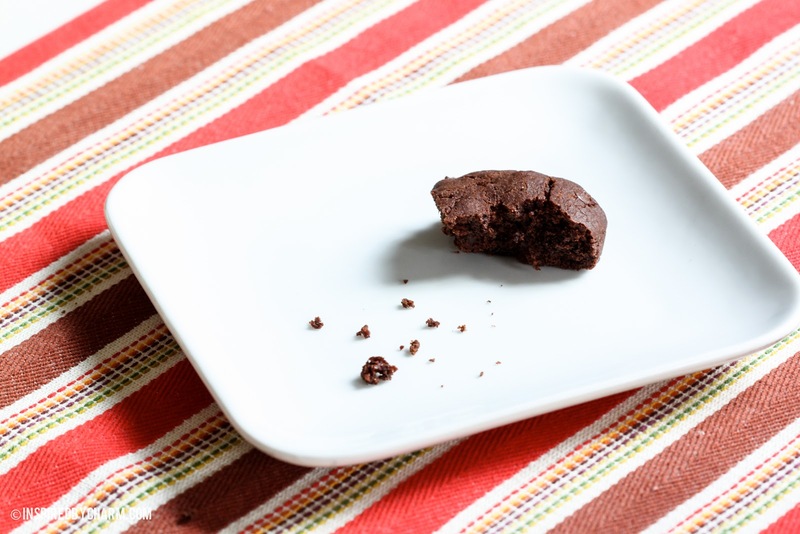 Sunday – Fall Baking Link Party!